Learn How to Make Chocolate at Home. In this Chocolate Making Tips tutorial, learn how to choose the right chocolate and how to melt it properly. Pure chocolates (real chocolate) contain cocoa butter and must be properly tempered in order to set up correctly. Tempering refers to a process of heating and cooling pure chocolate to ensure that the cocoa butter in the chocolate hardens in a uniform crystal structure. When you buy pure chocolate, it is in temper. When you melt the chocolate to reuse it, you take it out of temper and need to bring it back. White chocolate can also contain cocoa butter and need to be tempered, however, it doesn’t contain any cocoa liquor, so it isn’t technically considered chocolate. I will refer to it as white chocolate, for lack of a better term, when using it in a recipe. Some brands I recommend using are available on Amazon.com (commission earned for sales for all affiliate links listed below). I personally use Peters Burgundy (semi-sweet) and Ultra (milk chocolate,) but they are hard to find in small quantities. I really love Callebaut chocolates and highly recommend them. Tempering chocolate requires practice, but can be done in a home kitchen. This method of tempering will not give you high gloss chocolate, but will produce a finished chocolate with a nice snap. There are several other methods, but this is the easiest. If you are serious about making a lot of chocolate, you might want to consider buying some chocolate tempering machines. I own two Savage Brothers melters, and love them. I don’t have to hand temper my chocolates. The machines do the work for me. It’s great. Each of my machines holds 50 pounds of chocolate, which is the smallest Savage Bros. makes, but other companies make smaller tabletop tempering machines. You can even get a machine that will temper just one or two pounds of chocolate at a time. I prefer to use pure (real) chocolate to make my confections because the flavor is far superior to any other chocolate product. 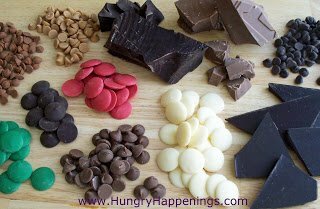 I have made some really fun holiday treats using pure chocolate and shared the recipes and tutorials here on Hungry Happenings. Confectionery Coating/Candy Melts/Almond Bark are made with vegetable oil and will melt and set up easily with little effort. This product is not as creamy or as rich as pure chocolate, but it’s easy to use and has a very pleasant flavor. Chocolate Chips can be pure chocolate or confectionery coating. You need to look at the ingredients to determine the type of chocolate. Pure chocolate chips will have cocoa butter listed in the ingredients. Most dark and milk chocolate chips are pure, but many white chocolate chips are not. It is common practice in old candy making recipes to add paraffin (wax) to melted chocolate chips so that the chocolate will set up properly. I don’t advise this, as it adds a terrible mouth feel and taste to the finished chocolates. Plus, who wants to eat wax? Not me. If you use chocolate chips to make candies, you have to temper the chocolate in order for it to set properly. If you don’t want to go to that much effort, then you are better off using confectionery coatings to make your candies. Store chocolates in a cool dry place away from direct sunlight. Pure chocolates have a shelf life of at least 18 months from the date of manufacturing and confectionery coating can last up to 9 months if stored properly. I don’t suggest refrigerating or freezing chocolate. If chocolate or confectionery coating is kept in the refrigerator or freezer for too long it will become wet and sticky and might develop white spots.if you do freeze or refrigerate your chocolates, you need to wrap them well and keep them wrapped as they thaw to avoid excessive condensation. If you are using a large block of chocolate or a candy bar, chop your chocolate into small uniform pieces. The best way to do this is to use a serrated knife to shave off small bits of chocolate. Place the knife blade on the edge of the chocolate block, and press down on the top of the knife while shaving off a small amount of chocolate. Then just chop any larger bits before using. 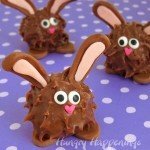 You can also grate the chocolate using a grating wheel in your food processor. Heat 1” of water over low heat in a saucepan. Place a bowl over the saucepan, being sure the bottom doesn’t touch the water. Put chopped chocolate, wafers, or chips in the bowl and stir occasionally until melted. It is very important that you do not allow any water to come in contact with the chocolate. Chocolate mixed with a drop or a few drops of water with seize (stiffen or harden). If this happens your only option is to add more liquid in order to get the chocolate smooth again. However, you can not use this thinned batch of chocolate for tempering or dipping as it will never harden properly. All is not lost as you can turn it into a delicious chocolate ganache or use it for baking. Every microwave is different so this is just a guideline, but it is safest to go slow and stir often. I always use high power for short busts of time. The amount of time needed to melt your chocolate will depend on how much chocolate you need to melt. The instructions below are based on 16 ounces of chocolate or confectionery coating wafers. Pour finely chopped chocolate, Candy Melt wafers, chocolate callets, or chocolate chips into a microwave safe bowl. Heat on high power for 30 seconds, remove from microwave and stir. Your chocolate wont look melted much at all at this point, but if you don’t stir it, you may burn the chocolate in the center of the bowl. Return to the microwave and heat for 30 seconds. At this point the chocolate will look only slightly melted around the edges. Continue to stir and the chunks will indeed start to become liquid. Continue to heat for 30 seconds. Now your chocolate will look more liquid, but you will have chunks remaining. Allow the chocolate to sit for 1-2 minutes, preferably in the microwave, then stir vigorously and the heat from the melted chocolate will melt the chunks. If, after stirring for a while you still have chunks of chocolate remaining, heat for 10-15 second intervals, stirring in between each until melted. Do not rush this process. Chocolate burns easily. If you do burn the chocolate, throw it away and start over in a clean bowl. To melt more than 16 ounces, you can increase your times by 10-15 seconds per interval. For 2 lbs. (45 seconds, 35, 25, 10). For 3 lbs. (60 seconds, 45, 30, 20). If your microwave is less powerful, increase the times, but go slowly. If, once melted, your confectionery coating is really thick, add Paramount Crystals or Wilton’s EZ Thin, which are flakes of palm kernel oil, to thin out the coating. You can use Crisco or vegetable oil instead, but your candy coating may be a bit soft once hardened. You can thin pure chocolate or chocolate chips by adding some cocoa butter. Now that you know how to choose the right chocolate or confectionery coating for your project you can use it to make so many wonderful treats. BE SURE TO CHECK OUT THESE OTHER CHOCOLATE MAKING TIPS TUTORIALS. How to Use Colored White Chocolate to Paint Candy Molds to make Lollipops and more. How to roll out modeling chocolate. How to Cut Modeling chocolate. Oooo… That sounds lovely! Coffee is one of my favorite aromas. Was that instant coffee grounds or brewed coffee? I found a recipe for coffee syrup the other day. It's similar to chocolate syrup. You mix it with hot or cold milk to make a coffee beverage. By itself it might make an interesting center to a dark chocolate candy. I'm afraid the concentrated coffee flavor would be to strong for a milk chocolate. I'll admit, that although my palate is very limited, planning flavor profiles and combinations is a lot of fun to me. Now I just need to get in the kitchen and explore them. I sprinkled on ground coffee, that I ground myself from fresh beans. Use a really good quality coffee. I too love playing with flavors and understand your desire to experiment! Thanks! If you are using pure chocolate (with cocoa butter in it) then you can leave it at room temperature to set. I use the refrigerator just to speed up the process. If, however you are using candy coatings (with palk kernal oil or some other oil) then you do need to freeze them so that you don't end up with spotting or streaking in your candies. LorAnn makes quite a few flavors of chocolate oils like Royal Raspberry, Kona Coffee, Orange Brandy, and Canadian Maple. I have tried these, and they have really good flavor. Don't use LorAnn hard candy oils, they wont work well in chocolate. You can't use anything that has any water in it either. Dry spices work well too. You can use wet ingredients when you are flavoring chocolate truffles. Fruit purees are great as are things like Rum, Frangelico, etc. Hope this helps. Have fun and let me know if you have any more questions. Debbie, I have listed one simple way to temper above in the text, but there are several ways to do it. Scroll down the page just a little way until you see Simple Tempering Method. The instructions are there. What a great webpage you have here! You are obviously a perfectionist, as am I, and you need to be to turn out the fussy little details which I love! I don't know what to try to make first! Thanks for inspiring me. I have had recent problems with my modeling chocolate but all otger web resources have been vague or contradict each other. This page has by far been the most helpful yet and will definitely be bookmarked! Thanks Sunni. I'm glad I can be of help. I've encountered so many issues with modeling chocolate over the years and have learned how to fix every problem. I hope you now have the knowledge you need to be successful in making modeling chocolate. There can be a number of factors involved here. It could simply be that by the time you poured the tempered chocolate into the molds it had cooled down to a point that it was no longer in temper. It is tricky keeping hand tempered chocolate in perfect temper while you are working as you only have a few degrees to work within (which depends on the chocolate you are using but is usually somewhere between 88-91 degrees Fahrenheit.) If the silicone mold had any residue in it that can effect the look of the chocolate as well. If the mold was cold or warm it can effect the outcome as well. I'm sorry I can't give a specific reason for your problem but I hope this helped. I suggest you keep an eye on the temperature of the chocolate at all times. That's the most important thing. If needed warm the chocolate back up by using a blow dryer to warm up the bowl (don't blow into the chocolate, rather around the edge of the bowl.) Just warm it briefly as you are just trying to raise the temperature a degree or two. Karen, here is an explanation from a chocolate maker that is really well written. His comments where in response to someone having trouble with hand tempering. I am glad I found your site. The information is so clear and detailed. Thank you. Thank you for the detailed information provided about chocolates and their variations. Very helpful for a beginner. Chocolate Calla Lily Bouquet!!!! I am so fancinated by this. Could you please send me the directions on how to make this beautiful bouquet. Thanks Connie. I will do my best to work on a step-by-step tutorial for this project sometime this spring. I am planning on a chocolate making party for 9yr olds. Id like to add some colours but im confused about doing that. Do i buy white chocolate and liquid/powder colouring? or is the coloured chocolate a different product altogether? I'm not exactly sure what products are available in Australia, but if you are having children make candies, it will be much easier to work with confectionery (candy) coating than pure chocolates. Here in America we can buy the candy coating already colored or we can buy white coating and color it ourselves using candy coloring or powder coloring. You have to make sure any coloring you use does not have any water in it, so look for candy or chocolate coloring. If you use the confectionery coating, you can melt it using my instructions above. If you buy pure chocolate, you should temper it in order for the chocolate to set properly. 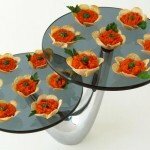 Tempering can be very challenging, that is why I would recommend having the kids use the coating. Hi very thanks for the info and tips. I was wondering what brand of white chocolate you use for making modeling chocolate. I use Peter's Chocolates for all of my professional candy making, but they aren't often easy to find for the home cook. If you have a cake/candy supply store in your area, you can ask if they carry the Peter's products. I tend to use the Peter's White Caps confectionery coating to make my modeling chocolate as I like the flavor. It does have a cream color instead of white. I have also used their pure white chocolate which has a really rich cocoa butter flavor but it is even more cream colored. 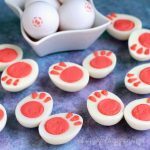 Since Peter's is harder to find for most people, I tend to create a lot of my recipes for my blog using Wilton Candy Melts. They can be found in craft stores and in places like Walmart. The flavor is quite a bit sweeter than the Peter's but the advantage to it is that it is bright white. Hi Beth. 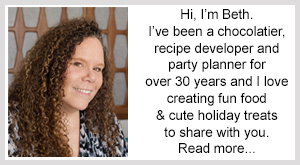 I found ur site while looking for help with keeping numerous colored chocolates warm for an extended period of time – great with the water bath concept! Thank u! 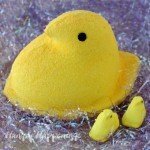 I am about to attempt the project again, but wanted to hear what your thoughts are about using plastic "squirt bottles" instead of glass jars or bowls when keeping the chocolates warm and usable. I was thinking of maybe putting a dishcloth in the bottom of the pan to keep the plastic bottle from too much direct heat. Any advice? Thanks! I do use the squeeze bottles on occasion. The only thing I don't like about them is that the chocolate in the tip hardens and I have to clean it out constantly. If I'm doing something were I will use up most of the chocolate in the bottle quickly, I'll use them. If not, I use the jars. I do think you could keep the squeeze bottles warm by using the water bath in the skillet method. If you keep the skillet on the lowest setting, it shouldn't get too hot for the plastic bottles, but a dishcloth on the bottom is a good idea. Just be sure to dry the bottle each time you pick it up out of the water. If you try this, let me know how it turns out for you. I stopped by your blog. You've done some really amazing artwork in chocolate. Are you spreading a thin layer of chocolate on acetate then wrapping it around the cake or are you covering a cake in modeling chocolate? Thank you for this fantastic tutorial. I just made a batch of modelling chocolate with Milk chocolate. The chocolate dough has come together,but the dough feels grainy and not very smooth. Also when I try to shape/knead the dough using my hand, the dough becomes soft and oily very quickly. Is this normal or have I done something wrong? Is it normal for some oil to be released when you are working with the chocolate dough while shaping it? Compound chocolate is very similar to Candy Melts, as it contains cocoa, vegetable fat, and sugar and it will work fine in this recipe. You can also use any pure milk chocolate containing cocoa butter. The recipe will taste better when you use pure milk or dark chocolate, but coating work well too. I am not familiar with your corn syrup product, I think your problem is that the mixture got too hot because you had to warm up the corn syrup which is what causes the oil to seep out. Yes, it is normal for oil to seep if the modeling chocolate gets too warm. Wrap your modeling chocolate up in plastic wrap and allow it to sit at room temperature to cool for a while. Then try to knead it until smooth. If your hands are warm, then try to knead it on a marble or granite surface. If the modeling chocolate is still grainy I would usually suggest adding some more corn syrup, but you can't add it hot. Do you have any honey? If so, you could add a small amount of that and knead it in. Add just enough until the modeling chocolate becomes smooth. If you make this again, try to warm up your corn syrup so it's liquid, then let it sit to cool to 89-90 degree Fahrenheit (32 degrees C) before mixing it in with your chocolate. That should help. Thanks for your prompt and detailed response! I agree – compound chocolate doesn't taste anything like real chocolate. Can I use any chocolate(like a Lindt chocolate bar maybe) to make modelling chocolate? If I use the chocolate bar, would I have to temper it? Or do I just melt it and add the corn syrup? Another thing – I don't fancy using the crazy corn syrup that I have. I like your idea of using honey. But I was wondering if I could use a simple sugar syrup instead? Or does it have to be "invert" sugar syrup? Do you think the sugar syrup (invert / regular) would work? I only use pure chocolate when making milk or dark modeling chocolate. The only time I use candy coating is for white modeling chocolate, mostly because I prefer the flavor, but you can certainly use pure white chocolate also. Bars are perfect and you don't have to temper it, per say, but you do always want to cool your chocolate to about 89-91 degrees Fahrenheit before adding in the corn syrup. This keeps your modeling chocolate from becoming greasy. I've had a lot of success using honey, dulce de leche and some other thick syrup. The first time I made modeling chocolate I did create my own simple syrup which I cooked until thickened. I actually learned this technique from Ewald Notter, a world renowned pastry chef. I felt it was a lot of work, being I have access to corn syrup, but it does work. I don't know where the recipe is and I couldn't find it on-line, but I vaguely remember that he cooked the simple syrup until it was very thick, probably at the soft ball stage, then he mixed it into the white chocolate. He then spent 30 minutes kneading the cocoa butter back into the modeling chocolate. It seemed like a lot of work, so be sure to allow the syrup to cool. You might give the invert sugar a try. I've not had any experience with that in this recipe but have used it to make marshmallows. I'm so happy to hear you were able to salvage your dark modeling chocolate. As I mention in the tutorial, my recipe is only a guide as every chocolate is different. I almost always have to add more corn syrup, but I like to feel it as I go and add it as I need it. I always end up with great modeling chocolate now that I know how to fix all the possible problems. 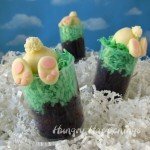 I'm wanting to use modeling chocolate for flowers on cupcakes at an outdoor event in May in Texas. Does it melt at the same rate as candy? I'd hate for my cupcakes to have wilted, melted flowers! Sad to say modeling chocolate is going to get soft and lose it's shape in the heat. It wont melt like chocolate and turn into a puddle, but the flowers will get very soft. If they are small and are not handled once warm, they might just hold their shape, but larger flowers will probably wilt. If you make them set them in the shade and if you can have a fan nearby that will help. That's excellent information you have here.Is it ok to keep the modeling chocolate figures in the refrigerator till they are ready to be used on the cake. Modeling chocolate doesn't usually do well in the refrigerator as it picks up condensation, so it will look like it's sweating when it's removed from the chiller. If the figures are small you won't notice much, but if they are large it will be quite noticeable. Incredible. 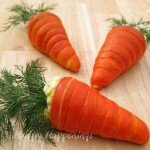 I just stumbled on this site; was looking for ways to decorate marzipan eggs.